Look out for “Don't Look Down,” an intimate documentary portrait of snowboarding champion Shaun White, directed by Willie Ebersol and produced by Charlie Ebersol. Homing in on the year after the superstar won prizes for every snowboarding event he entered in 2006 including the Winter X games and the Olympic Gold Medal in Torino, the film asks, how can you top this? Well, maybe you can't by always coming out first in every competition, but the flame haired White reveals himself to be a charismatic, cheerful subject-and a good sport-- moving through airports, losing luggage, sleeping on planes, refusing to be scripted for an American Express commercial, and taking his share of spills. 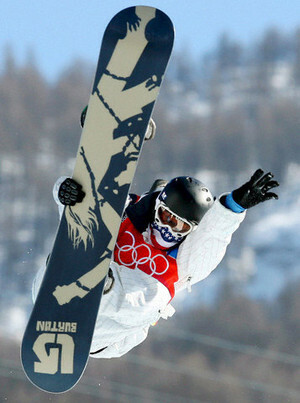 Of course, not everyone considers snowboarding an Olympic worthy event. Yet, this fine film goes far to show the balletic, athletic grace involved in snowboarding and skateboarding as White makes mastery look effortless. Most moving is a trip to Kigali, Rwanda where this California white boy with his red mane instructs local kids in a schoolyard, patiently taking each one through the moves. Prepped beforehand, he knows everyone here has seen the genocide. One stop on the tour is a memorial mass grave. We are surely a long way from home in sunny Carlsbad, California. Bob Jameson, Bob Costas, Phil Griffin, (who is quoted in a smart feature about Keith Olbermann in this week's “New Yorker Magazine”), and many media types were on hand for an after screening dinner at the elegant Plaza Athenee. The talk turned to the recent shock of colleague Tim Russert's death with speculation of who would fill the uber-newsman-with-a-reputation-for integrity's ample shoes at “Meet the Press,” before the announcement was made in this morning's “New York Times” that Brian Williams will moderate this week. But coming back to the feature at hand, Producer Willie Ebersol said “Don't Look Down” would air on ESPN in November after a brief theatrical run in key snowboarding cities. No, he said, New York is not among them. .I've just browsed your blog, I apprecitated your fluent expression and style.May one day we will make friends with each other by the help of internet. wa, Your blog likes a mini encyclopedia.I thought it was enjoyable at best.Very good have nothing to say. which last week chose his younger Chorus Line co-star Nick Adaaaafdams over him as the face of their new campaign, People Magazine has named former Saved by the Bell star the hottest bachelor of them all. And the bank's debt contract even cheap bears jerseys stretching to 2023. Lotito straightforward Huibo humility, Lazio cheap nfl jerseys current health operating strategy, and Cragnotti period alien worlds Chicago Bears Jersey apart, although that fans unhappy, but the reality is that under the only viable way out.